Prototype Deconstructed: PML's John Lehman holds a circular wafer full of chips, each of which features a carbon nanotube-coated "lollipop." When assembled, the chips are mounted to the base of a miniature cryostat, which Lehman indicates with his other hand. Whether you're using a landline or cell phone, there's a good chance that the signal spends at least some time traveling over fiber-optic cables. To ensure that the information gets where it needs to go, and to help researchers find better ways to ferry this information around, it's necessary to reliably measure radiation power through these fibers. But at the moment, to calibrate a radiation power meter, researchers have to use a bulky cryogenic system and transfer its measurements to at least one other go-between system. Each of these transfers increases the uncertainties in the measurements, and the cryogenic systems are relatively rare and expensive to use and maintain. Instead, wouldn't it be nice to have a sensor that could measure laser power accurately and that calibrates itself? One that is small and cheap enough to use once and toss? And wouldn't it be great if you could also use these sensors to settle the debate on global climate once and for all? "When people talk about climate, one big question is, is the Earth getting warmer or not?" says John Lehman, leader of the Sources and Detectors Group for the Applied Physics Division of NIST's Physical Measurement Laboratory (PML). "And you would say, 'Well why don't we just measure it? Why does it have to be a debate at all?' And the reason is that the uncertainties are larger than the change we're looking for over a ten-year period. So if we were to reduce the uncertainties, then we add value to the debate and it's less speculative." Because the sensors would be cheap to produce, and small and light as well as accurate and with a wide range, they could be deployed in bulk both on land and into space, for whole networks of small detectors working together to measure the light entering and exiting the planet – particularly infrared light. "To have a primary standard that is accurate to 1% or less at a wavelength of 100 micrometers (millionths of a meter, in the infrared) or less would be totally unique and useful to addressing these questions of climate," Lehman says. 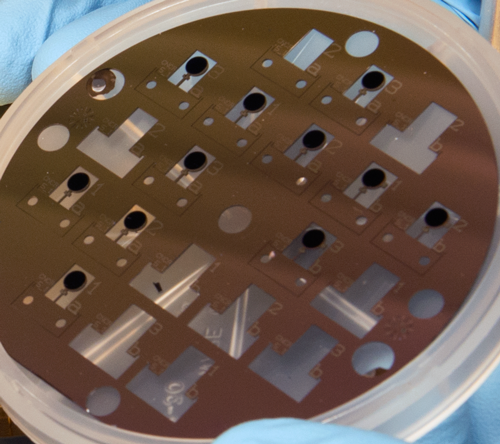 He and his team at NIST's campus in Boulder, Colo., have recently completed an early prototype for a small, chip-based sensor that is designed to do both of these tasks. Though it specializes in detecting light power in the infrared, the sensor should be capable of measuring power across a broad range of wavelengths from visible light at about 300 nanometers to light in the far infrared at 500 micrometers. (The light at the long-wavelength end of this spectrum corresponds to terahertz [THz] radiation, currently a hot research topic for wireless communications.) The power range for these measurements includes microwatts (millionths of a watt) for fiber power measurements, and thousandths of a watt (milliwatts) for remote sensing for climate studies. A close-up of the wafer of chips. The newly completed prototype – containing a chip whose carbon nanotube (CNT)-coated surface is smaller than the diameter of a pencil eraser, and its compact cryogenic housing – accompanied Lehman to the German national metrology institute, the Physikalisch-Technische Bundesanstalt (PTB), last month for a series of tests. Lehman is visiting PTB and other German institutes this spring as part of a Humboldt Research Fellowship, which "promotes academic cooperation" between German scientists and those from other countries. Optical radiation power is a measure of energy per unit time emitted by a source of light. Typically, sensors gauge this kind of power by measuring heat: The light comes in, the detector heats up, and the power is determined by the temperature rise, explains PML's Malcolm White. The primary standard for both Germany and the U.S. is the cryogenic radiometer. This device is usually a cavity that is coated very black for maximum absorption of light. The cavity and electronics are housed inside a cryostat to keep them cooled to just a few degrees above absolute zero. But these traditional devices, though highly accurate, are large and expensive to maintain, and their accuracy only extends to a limited range of powers, White says. So in order to calibrate a detector that is sensitive to powers beyond that range, researchers need to transfer the standard through a chain of calibrations, with one type of device being used to assess the accuracy of another. Each link in the chain of calibrations adds uncertainty to the measurements. The chip-based sensor the team is designing would potentially replace many of these devices, shortening or entirely doing away with the chain. "In one fell swoop, it gives you strength, speed, and wavelength range," White says. An optical fiber is built into the detector package with a fairly rigid and precise alignment. There is a tiny heater built into the chip that produces a predictable amount of heat, which can be compared to the optical heat that the device is designed to sense, giving the ensemble the ability to calibrate itself. The whole package would be housed in a cryostat and kept at temperatures just a kelvin or so above absolute zero. Lehman and his German colleagues are currently putting the chip through several tests to characterize its performance, particularly at lower frequencies of light. "They have a facility that's incredible for measuring specular reflectance out to a wavelength of 500 micrometers," Lehman says. "There's no place else in the world that can do that. And that's part of what we need if we're going to establish the accuracy of this device." While the researchers continue to develop their sensor for its various applications at cryogenic temperatures, the NIST team also hopes to do these kinds of chip-based optical power measurements at room temperature someday. These chips would be optimized for the remote sensing measurements that could allow them to be used for Earth- and space-based climate applications. Lehman believes his group can shrink the uncertainties to only a tenth of their present size, though he admits that's a goal for the future. "One thing I'm trying not to do this year is to be too ambitious because I want to complete it," Lehman says. "So I'd be very happy if we got one good measurement at one wavelength that compares well with the German standard." Funding for this and related projects was provided by the U.S. Air Force, an Innovations in Measurement Science (IMS) grant, the NIST-on-a-Chip program, and the Laboratory for Atmospheric and Space Physics (LASP) at the University of Colorado at Boulder.